Seven extragalactic supernovae have so far been observed in M61, making it one of the most prodigious galaxies for such cataclysmic events. These include: SN 2014dt, SN 2008in, SN 2006ov, SN 1999gn, SN 1964F, SN 1961I, and the first to be observed, the Type II-K SN 1926A, which appeared on 9 May 1926. Spiral galaxy Messier 61 is aligned face-on towards Earth. ^ Tschöke, D.; Hensler, G.; Junkes, N. (2000). "X-rays from the barred galaxy NGC 4303". Astronomy and Astrophysics. 360 (2): 447–456. arXiv:astro-ph/0006361. Bibcode:2000A&A...360..447T. ^ "A hungry starburst galaxy". ESA/Hubble Picture of the Week. Retrieved 29 April 2014. ^ a b c d e f g h i j k l m "NASA/IPAC Extragalactic Database". Results for M 61. Retrieved 2006-11-18. ^ a b "Messier 61". Archived from the original on 2017-01-06. Retrieved 2017-01-11. ^ "Galaxy On Line Database Milano Network (GOLDMine)". Retrieved 2012-08-06. ^ de Vaucouleurs, Gérard (April 1963). "Revised Classification of 1500 Bright Galaxies". Astrophysical Journal Supplement. 8: 31. Bibcode:1963ApJS....8...31D. doi:10.1086/190084. ^ Jiménez-Bailón, E.; Santos-Lleó, M.; Mas-Hesse, J. M.; Guainazzi, M.; Colina, L.; Cerviño, M.; González Delgado, Rosa M. (2003). "Nuclear Activity and Massive Star Formation in the Low-Luminosity Active Galactic Nucleus NGC 4303: Chandra X-Ray Observations". The Astrophysical Journal. 593 (1): 127–141. arXiv:astro-ph/0304465. Bibcode:2003ApJ...593..127J. doi:10.1086/376554. ^ a b Colina, L.; Gonzalez Delgado, R.; Mas-Hesse, J. Miguel; Leitherer, C.; Jimenez Bailon, E. (2002). "Detection of a Super-Star Cluster as the Ionizing Source in the Low-Luminosity Active Galactic Nucleus NGC 4303". The Astrophysical Journal. 579 (2): 545–553. Bibcode:2002ApJ...579..545C. doi:10.1086/342839. ^ Pastorini, G.; Marconi, A.; Capetti, A.; Axon, D. J.; Alonso-Herrero, A.; Atkinson, J.; Batcheldor, D.; Carollo, C. M.; Collett, J.; Dressel, L.; Hughes, M. A.; Macchetto, D.; Maciejewski, W.; Sparks, W.; van der Marel, R. (2007). "Supermassive black holes in the Sbc spiral galaxies NGC 3310, NGC 4303 and NGC 4258". Astronomy and Astrophysics. 469 (2): 405–423. arXiv:astro-ph/0703149. Bibcode:2007A&A...469..405P. doi:10.1051/0004-6361:20066784. ^ Koopmann, R.; Kenney, J. D. P. (2004). "Hα Morphologies and Environmental Effects in Virgo Cluster Spiral Galaxies". The Astrophysical Journal. 613 (2): 866–885. arXiv:astro-ph/0406243. Bibcode:2004ApJ...613..866K. doi:10.1086/423191. ^ Kenney, J. D.; Young, J. S. (1986). "CO in H I-deficient Virgo cluster spiral galaxies". The Astrophysical Journal Letters. 301: L13–L17. Bibcode:1986ApJ...301L..13K. doi:10.1086/184614. ^ a b c "List of Supernovae". Central Bureau for Astronomical Telegrams. Retrieved 2011-07-03. ^ Boffi, F.R. ; Sparks, W.B. ; Macchetto, F.D. (1999). "A search for candidate light echoes: Photometry of supernova environments". Astronomy and Astrophysics Supplement Series. 138 (2): 253–266. arXiv:astro-ph/9906206. Bibcode:1999A&AS..138..253B. doi:10.1051/aas:1999274. ^ "A portrait of a beauty". www.eso.org. Retrieved 7 January 2019. 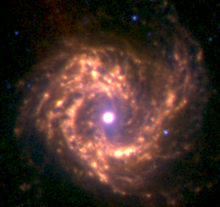 Wikimedia Commons has media related to Messier 61. This page was last edited on 30 March 2019, at 17:38 (UTC).